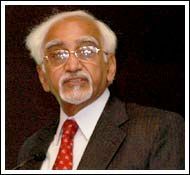 Gandhinagar, Dec 26 : Vice-President Hamid Ansari will inaugurate the 17th National Children's Science Congress (NCSC), one of the country's premier academic events, in Ahmedabad Sunday. The opening function will be presided over by Gujarat Governor Kamla Beniwal with Chief Minister Narendra Modi as the chief guest. Yash Pal, President of National Council for Science & Technology Communication (NCSTC) network, will be present at the function as the guest of honour. "Around 800 child scientists, including 100 from SAARC countries, selected through a rigorous process that involved the work of around eight lakh children countrywide, are slated to take part in the programme. Apart from this, over 50,000 students will engage themselves in the various scientific activities being organised as part of the conclave," Gujarat's Principal Secretary & Convener, Department of Science & Technology, Ravi Saxena, told IANS Saturday. "The programme is so important for the students having inclination towards science that every year, around eight lakh child scientists compete to take part in the conference at district and state level, but only a few of them can fulfil their dream of displaying their innovative models and ideas at the event," he added. The five-day event will end Dec 31. The 17th NCSC, which will revolve around the central theme of 'Planet Earth - Our Home, Explore, Care and Share', will also focus on some important areas such as atmosphere, hydrosphere, lithosphere, biosphere and energy. Gujarat is the 17th state in the country to host the event and 26 projects from the state will be displayed at the event. Prominent scientists will take part in the interactive sessions and answer questions of students in order to satisfy their curiosity.